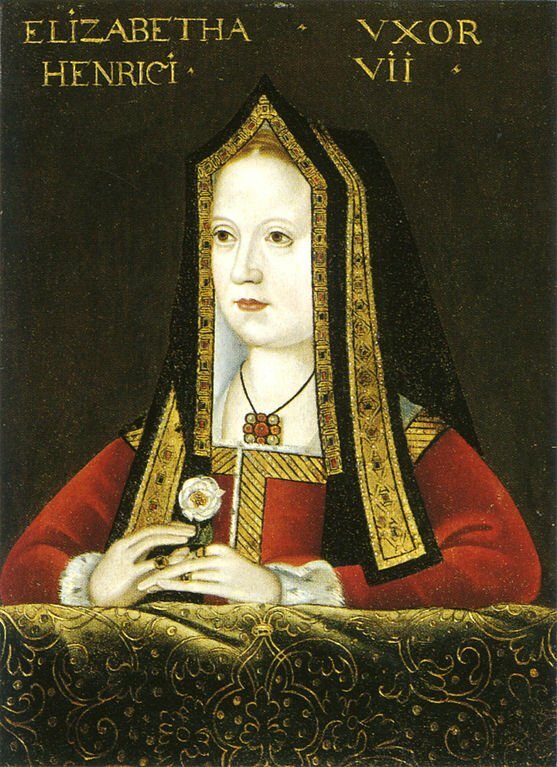 Elizabeth of York symbolized the epitome of the perfect medieval queen. She was beautiful, charitable, and beloved by the people. By marrying Henry Tudor, who had taken the throne of England by conquest, the Houses of Lancaster and York were united and the War of the Roses came to an end. And Elizabeth was the mother of an heir who would become King Henry VIII of England and two of her daughters would become queens. Elizabeth of York was born at the royal palace of Westminster on February 11, 1466. She was the eldest child of Queen Elizabeth Wydeville and King Edward IV of England. While she was still young she received religious instruction, learned manners, embroidery, music, singing, dancing and other necessary things in preparation for her role as a royal wife and mother. When Elizabeth was four years old, her father named her as his heiress and brokered a betrothal with George, the son of John Neville, Marquess Montagu. This was clearly a politically expedient arrangement as Edward was attempting to create a bond with the Nevilles after they had participated in an uprising against him. Neville was to die in the Battle of Barnet in 1471 so the betrothal was broken. In September 1470, King Edward was forced to flee England when Margaret of Anjou and the Earl of Warwick were threatening to invade and take back the throne for the Lancastrian King Henry VI. Elizabeth’s mother was forced to flee to sanctuary within the confines of Westminster Abbey with her children where they would remain for five tense months. In medieval times, criminals and others could take refuge in church or its precincts providing for immunity from the law. On November 1, 1470, Elizabeth Wydeville gave birth to a son named Edward, making Elizabeth second in line for the throne. King Edward was encouraged by the birth of a son and provided with money by his brother-in-law, Charles the Bold, Duke of Burgundy. He gathered a fleet and raised an army to return to England to fight against his own rebellious brother George, Duke of Clarence and the Earl of Warwick. Upon arriving, his brother made peace with him. Edward gradually made his way to London where he entered with no resistance. Elizabeth Wydeville and her children were released from sanctuary and there was a joyous family reunion. King Edward would eventually defeat the Earl of Warwick and Queen Margaret of Anjou in battle and King Henry VI would die in the Tower. This resulted in a period of relative peace in the realm. By the time Elizabeth was five or six, her formal education began. She was taught to read and write. She learned managerial skills such as running a household, managing servants, how to do accounting for the household budget, and delegating responsibilities. She may have read and spoke French and she grew to love books. She is described as being devoted to God, obedient to her parents, loving toward her brothers and sisters and dedicated to helping the poor. In 1475, King Edward invaded France. He would come to terms with King Louis XI on August 29, 1475 with the Treat of Picquigny. It settled the conflict between England and France and provided for Elizabeth to marry Louis’ son and heir, the Dauphin Charles when they became of marriageable age. Elizabeth was to go to France for the wedding at the age of twelve. When Elizabeth turned twelve, preparations for the marriage which had dragged on finally stalled. She had grown into a real beauty with blond hair and a fair complexion. If the effigy in Westminster Abbey is accurate, she would have been about 5 feet 6 inches tall. In March of 1482, Mary of Burgundy died after falling from her horse and King Louis annexed the duchy of Burgundy for France and arranged for his son Charles to marry Margaret of Austria, Mary of Burgundy’s daughter. So Charles’ betrothal to Elizabeth was called off. A year later, on April 9, King Edward IV died unexpectedly and Elizabeth’s life was thrown into turmoil. Her mother fled to sanctuary once again with her children and her brothers were imprisoned in the Tower. Elizabeth’s uncle, Richard, Duke of Gloucester had Elizabeth Wydeville and Edward IV’s marriage declared bigamous due to an alleged prior contract of marriage by Edward and had all his children pronounced illegitimate. Gloucester was declared King as Richard III and eventually, Elizabeth’s brothers Edward and Richard disappeared from the Tower. Plots and rumors arose that someone would rescue Elizabeth and her sisters from sanctuary and take them overseas. Because Elizabeth was considered by some as her father’s heir, this was worrisome for King Richard. On Christmas Day 1483, Henry Tudor, who had emerged as a figurehead of the opposition to Richard, swore an oath at Rennes Cathedral in France to marry Elizabeth if he became king. On March 1, 1484, Richard and Elizabeth Wydeville reached an agreement allowing Elizabeth and her sisters to come out of sanctuary. Richard guaranteed their safety and promised to keep them in a manner according to their rank, give them an income and find them suitable husbands. After the death of King Richard’s wife Anne Neville in March 1485, there was sufficient enough speculation that Elizabeth would marry her uncle that Richard had to publicly deny the rumors. Elizabeth Wydeville was most likely plotting with Margaret Beaufort to marry Elizabeth to Beaufort’s son Henry Tudor. In August 1485, Richard was defeated by Henry Tudor and his forces at the Battle of Bosworth. Henry gained the throne of England by conquest and became King Henry VII. One of his first acts as king was to reverse the declaration of Elizabeth and her siblings’ illegitimacy. She was brought from her location somewhere in the north openly to London to stay with his mother at Coldharbour where she awaited word she would become Queen. Henry took his time in marrying her but after being urged by parliament, the wedding took place on Jan 18, 1486 although she was not crowned yet. Henry came to value if not love Elizabeth. She was beautiful, charming, generous, virtuous, gentle and kind. His union with her legitimized his conquest and ended the years of strife the civil war had caused. Both Elizabeth and Henry had Yorkist as well as Lancaster components to their households. The couple had similar interests like court ceremonial, dancing, gaming, music, gambling, plays, Morris dancers and other entertainers. She made no attempt to enter the political realm after her marriage. She concerned herself with the traditional roles of a Queen consort such as her household, her estates, her court and her children. If she did have any role in politics, it was behind the scenes and in private with her husband. She traveled extensively, sometimes with Henry and sometimes on her own. Elizabeth was either pregnant when she married or became pregnant immediately afterwards. On September 20, 1486, she gave birth to a fair prince, named Arthur after the legendary king. Elizabeth suffered greatly and was weak after the birth, possibly of puerperal fever. This may be why she didn’t become pregnant for another two and a half years. After the birth of her son, Henry paid for a coronation ceremony which took place on November 25, 1487. On November 28/29, 1489, Elizabeth gave birth to a daughter named Margaret. Prince Henry, the future Henry VIII, was born on June 28 1491. Prince Arthur was brought up in his own household away from court but the other children would grow up at Eltham Palace, far from the noisome London air. Elizabeth and her mother-in-law Margaret Beaufort oversaw the rules of how the royal nursery was governed. Elizabeth was very family oriented. She loved and supported her children, her sisters and other relations. She kept her sisters at court and arranged marriages for them. On July 2, 1492, she gave birth to a daughter Elizabeth. This daughter would die on October 7, 1495. Around this time negotiations were ongoing to marry Prince Arthur to Catherine of Aragon, the daughter of Ferdinand and Isabella of Spain. Elizabeth’s daughter Mary was born on March 18, 1496 at Sheen Palace. The nursery at Eltham was dominated by women and Henry, Margaret and Mary became very close to their mother. Another prince named Edmund was born on February 21, 1499. He would die in June of 1500. In early November 1501, Catherine of Aragon arrived from Spain to marry Arthur and Elizabeth greeted her. The couple was married on November 14. This alliance was politically important for the stability of the Tudor dynasty. Catherine and Arthur left for Ludlow where Arthur would continue his training and education for the throne. But in March of 1502, both Catherine and Arthur became ill with what the chronicles say was the sweating sickness. Catherine was to survive but Arthur died. On April 4th a messenger arrived at Greenwich Palace near London to inform the privy councilors of the sad news. The council called upon King Henry’s confessor to break the news to him. The King was shocked by the news and called for the Queen. Elizabeth did her best to comfort the king by reminding him that he was the only child of his mother and they had another son and their two daughters. She also reminded him they were still young and could have more children. Henry thanked her for her kind words and Elizabeth returned to her apartments. Once there, she broke down in deepest grief. Her ladies called for the king to comfort her. He appeared and did his best to quiet her, reminding her of her own brave words in comforting him. Elizabeth was to stay in mourning for most of the rest of the year and her health began to suffer, possibly from the shock of Arthur’s death. She sought medical help during this time and this may indicate she was suffering from some underlying health issue. Due to Arthur and little Edmund’s death, she may have felt the need to try for another child, even though she had difficulties after her pregnancies in the past and she was increasingly ill.
By July of 1502 she was in the early stages of another pregnancy. Sean Cunningham, in his biography of King Henry VII suggested she was suffering from an iron deficiency and her pregnancy could have exacerbated the symptoms. Elizabeth’s baby was due in the middle of February. On January 26th, Elizabeth and the King decided to stay in the Tower and on that day, Elizabeth and her sister Katherine arrived there. Elizabeth went into labor in the morning on February 2nd. The early labor was a surprise as she was expected to deliver at Richmond. The birth was difficult. The child was named Katherine. Both the baby and Elizabeth were weak and by February 9th, Elizabeth became very sick. She possibly developed puerperal fever and her iron deficiency may have made her condition worse. On the 10th, the king was calling for physicians to come to the aid of the queen. But it was all in vain. Elizabeth died in the early morning of February 11th, her 37th birthday. The King was devastated. He assigned some officers and his mother to arrange the funeral, took a boat to Richmond and shut himself up in a private place to mourn. Elizabeth was loved by her husband, her children and the people of England. Her baby daughter died on February 18th. Henry paid for a lavish and magnificent funeral. Construction had just begun on the Lady Chapel in Westminster Abbey where there was to be a tomb for Elizabeth and Henry. Until this was built, Elizabeth was buried in a vault specially made for her in the crossing of the abbey, between the high altar and the choir. The magnificent Lady Chapel was consecrated the day after the death of King Henry VII in 1509. He was buried in the large vault that was constructed there and Elizabeth’s body was exhumed and buried next to him. Their son, King Henry VIII commissioned the magnificent effigies that adorn the top of the tomb now.